Getting out and exploring the outdoors is a wonderful way to stay healthy and fit. While some of us prefer hiking, walking or jogging, others enjoy paddling along a lake or floating down a river in a kayak. 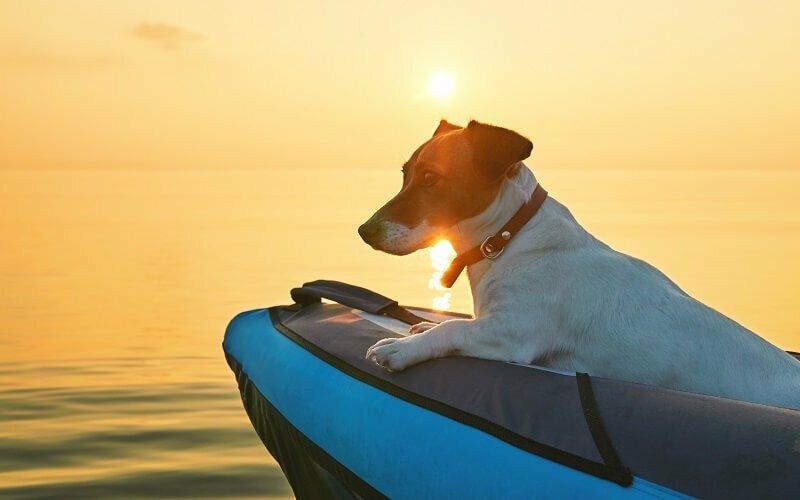 While it may seem impractical or even unsafe to take your dog kayaking with you, there are a number of reliable inflatable kayak options that fit the task. Our Recommendation: The Intex Explorer K2 Kayak. Read the review below for more information or click here to check it out on Amazon. Of course, it is important to follow a few basic rules before setting out on the water with your dog. First and foremost, even if your dog is an excellent swimmer, it is always beneficial to be sure they wear a life vest. This will keep him afloat in the event of an emergency, and also makes him visible in the water. Second, be sure to give your dog time to get familiar with the kayak while you are still on shore. This means letting him sit inside so you get an understanding as to what position is the most comfortable for him. Inflatable kayaks are generally meant to be used in smaller bodies of flat water, so be sure you are familiar with the area you are visiting to avoid unexpected encounters with whitewater. In this post, I will pick the best inflatable kayak for dogs, and also explain what you should look for before buying one. Why Are Inflatable Kayaks A Better Choice For My Dog? If you are concerned about your dog’s claws ripping through an inflatable kayak, it may seem as though it would be more practical to purchase one of the harder plastic models. The truth is that inflatable kayaks can stand up to far more damage than you would think, and they are also beneficial for your dog’s comfort. The material has more give to it than rigid plastic, which is easier on your dog’s paws. In elderly dogs or those with joint problems, inflatable kayaks prevent pain by absorbing some of the impacts of rougher water. What Should I Look For In An Inflatable Kayak For My Dog? This is probably the most important quality in selecting a good inflatable kayak. Even the best-trained dog or one who is very familiar with kayaking can still be unpredictable if they get excited or scared. If your dog suddenly moves or tries to jump overboard, it is necessary to have a kayak that provides enough stability to avoid tipping over or other safety issues. Pay close attention to the weight limit your kayak is capable of handling, particularly if you have a larger breed. Even though the color of your kayak may seem trivial, there is far more to it than just personal preference. You want to look for a kayak that is red, yellow, orange or some other bright color rather than selecting a black or grey model. The brighter the color, the more visible you and your dog are to boaters and people on shore. If you should ever run into an emergency situation, you want your kayak to be easily seen, and darker hues can be difficult to see, particularly around sunrise and sunset. Dogs nails can be very sharp, meaning that they can easily puncture or tear cheap materials. In an inflatable kayak, even the smallest rip in the material lets in water. If you are planning on taking your dog kayaking with you, look for a boat that is made from a rugged material, such as vinyl. Whether you are going for a quick paddle around the lake or on an all-day excursion, you want to be sure that both you and your dog are as comfortable as possible. Inflatable seats provide a soft cushion, particularly if there is a backrest attached. Small to medium sized dogs may enjoy having a seat of their own to sit in, while other pet owners prefer to exclude the second seat so there is a place on the floor for their dog to curl up. When we set out on an adventure by ourselves, we need to bring a certain number of things with us, such as food, water and even an extra set of clothes. The need for adequate storage space on your inflatable kayak is even more important when you bring your dog. Particularly if you are kayaking in salt water, having an ample supply of fresh water is absolutely vital, as is some food, a few dog treats and a leash in case you decide to go ashore for a while. An ideal choice for any kayaker and their canine companion, this kayak is at once convenient, comfortable and durable! Effortless to inflate and deflate, the Driftsun Voyager quickly expands to its ten-foot-long capacity, weighing just under thirty pounds when deflated, and it can be easily folded and placed in a carry bag for storage or transportation. The PVC/tarpaulin material along the bottom not only stands up to your dog’s nails, but it also prevents damage from underground rocks, sticks and the like as well. The nylon covering is also tear resistant, coupled with Boston valves that are absolutely guaranteed to be leakproof. A removable fin allows for directional accuracy, and the interior plug can be easily removed to allow for water to drain. It is very steady in mild to moderately choppy weather, providing a greater sense of stability for you and your dog. This product is manufactured by Driftsun, a company based in Chico, California that focuses on providing inflatable equipment to aquatic thrill seekers. Easy to inflate, deflate, transport and store. Extremely durable and hard to damage. Package includes everything you need, so you do not need to purchase lots of additional accessories. Removable fin allows you to stay on course, even in windy conditions. While the paddles are lightweight and easy to use, they do not stand up well to rough conditions. This is the ultimate package, as you get everything included that you could want, including inflatable seats, a double action air pump, and two lightweight oars! There is even a repair kit for on the go situations, as well as a convenient travel bag that stores the kayak when it is deflated. This two-person kayak provides ample room for you and your dog. Perfectly suited to exploring smaller bodies of water, you will have everything you need to ensure a safe and comfortable adventure! The Intex Explorer K2 Intex Explorer K2 has a weight limit of up to four hundred pounds, so larger breeds can easily go along for the ride! At just over ten feet in length and three feet wide, it is large enough to be both stable and comfortable, and the durable vinyl material stands up to your pet’s paws as well as rocks and other hazards. There is an inflatable I-Beam floor that helps to provide structure to the bottom, as well as grab lines on both ends to make transportation easy. Dual inflatable seats with backrests can be used at your convenience, and are easily deflated and stored when not in use. This product is manufactured by Intex Recreation Corp, a company that specializes in inflatable airbeds, pools, and spas. The two inflatable seats are included, as well as a pair of lightweight, aluminum oars, a high output air pump, and emergency patching kit. There is also a removable skeg that helps provide consistency in direction. Able to comfortably and safely accommodate larger dog breeds. Very easy to use and efficient. Inflates and deflates quickly. Bright yellow color is both attractive and highly visible. Can be somewhat difficult to keep on course during windy conditions. Low-sitting seats can be uncomfortable for some people. This is an excellent option for anyone who wants to explore the lake with their canine companion. Easy to use and easy to store, it is perfect for beginners! If you have a very large dog, want to take both your medium sized dogs kayaking together, or wish to take a romantic trip down the river with your significant other and your dog, this inflatable kayak meant for three is a great choice! The Sea Eagle SE370 has an impressive weight limit of 650 pounds! Not only can it carry all of your furry friends, but it is also rated for adventure, being capable of traversing up to Class III whitewater! A drain valve allows you to easily expel any water that made its way in after docking, and the dual skegs on the bottom are great for increasing speed and directional accuracy. Plus, A hull made from PolyKrylar stands up to even the sharpest claws, and there is ample storage space for supplies and even camping gear. This product is manufactured by Sea Eagle, a family-owned business based in Long Island that dates back to the late 1960s. Not only do you get a set of inflatable seats that can be easily removed, but there is also a set of inflatable spray skirts to keep you dry in rough conditions. A pressure gauge and repair kit are also included to ensure maximum safety. The best inflatable kayak for large dogs. Three person capacity allows for multiple dogs at once. Excellent for thrill seekers, as it can handle Class III rapids. Can be difficult and cumbersome to carry alone once it is inflated. If you and your dog(s) are always up for an adventure, the Sea Eagle SE370 is an excellent option for exploring rougher water! In spite of its impressive size, it is relatively lightweight when deflated and can easily be stored and transported. If the only thing you love more than fishing is fishing with your dog, this is a perfect choice for an inflatable kayak! You can fish the day away without worry thanks to the multiple air chambers. This particular design means that even if your dog’s nails happen to puncture one area, the water will be contained rather than flowing into other chambers. The Sevylor Coleman Colorado is just about as durable as it gets, with a combination of 18-gauge PVC and a tarpaulin bottom. This means that it can stand up to your pet’s paws time after time, while a stain-resistant nylon cover helps keep it clean. The rod holders are totally adjustable, so you can find your perfect spot and lay your pole in place. The hands-free fishing afforded by this kayak is even more fun with the trolling motor, allowing you access to places a typical kayak wouldn’t be able to handle. This product is manufactured by Sevylor, a company founded in 1948 which specializes in producing high quality, inflatable recreational water products. The kayak comes with adjustable seats and a set of lightweight aluminum oars. Makes hands free fishing a breeze with adjustable rod holders and a trolling motor. Rugged material stands up to your dog’s claws. Some consumers report that the inflatable chambers begin to warp as time goes on. In short, this is a dream kayak for a fisherman and his dog. Not only do you have ample space for storing supplies and your daily catch, but the material is also sure to stand up to even marked use time after time! If you have a passion for kayaking and want to include your dog, purchasing an inflatable kayak is the ideal way to go! My recommended best inflatable kayak for dogs is Intex Explorer K2 Kayak. Click here to check it out on Amazon. The softer, yielding material is far better on their paws and joints than harder plastic models, and as long as there is ample room, they have a spot where they can curl up and relax if they get tired of watching the water. Be sure to adhere to weight limits and any other restrictions and that everyone aboard wears a life vest. This way, you and your dog will be in many days of fun on the water!